Last year I posted about our favourite homemade Father’s Day gift, an origami shirt and tie garland. The kids loved making it and their Papa loved receiving it. We still admire it on a daily basis and according to my site statistics it’s the one readers come to visit the most (it’s even featured on the Disney blog Spoonful here). As some of you may know, origami is very popular in this house (post to prove it here). We spend hours folding everything from cranes (once we even folded 1000 for a special friend), balls, mice, pianos and even the odd piece of lingerie. Whenever we have kids over to our house the origami box is usually the first thing that comes out and my kids love passing on their folding skills to others. Since Mother’s Day is coming up (On May 12th in Italy) I thought it would be a nice idea to make the origami dress version of the shirt and tie garland. My kids learned how to fold this dress a few years ago and we have a house full of them. 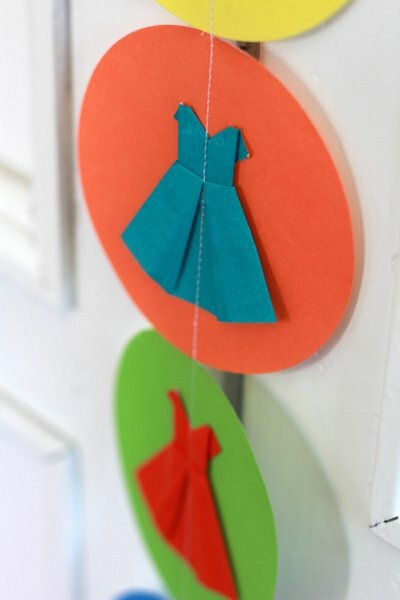 For this garland the kids folded tiny versions of the origami dress and then sewed them onto round pieces of paper. The garland can be folded (carefully) up and slipped into an envelope to be opened on Mother’s Day. Very sweet. 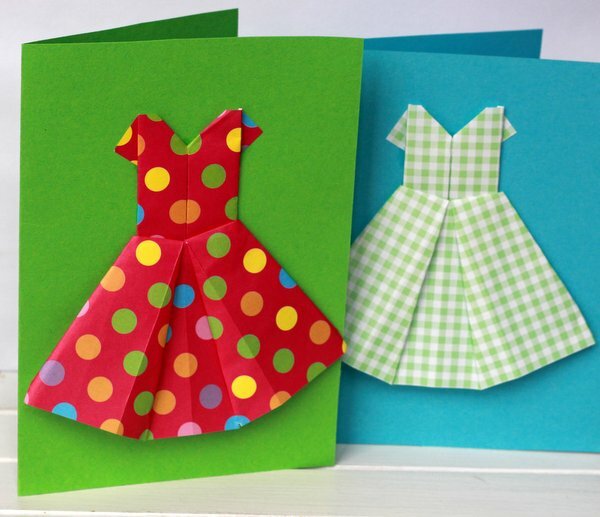 The kids also folded some larger dresses and made them into cards. They only glued the top of the dress onto the cardboard which makes the skirt puff out a little. Very pretty. And very quick to do. Here is a little video of my daughter showing how to fold a paper origami dress. Please ignore the irritating music, I’ll try and find something a little more soothing soon. Awwww your daughter folds like a PRO! So nice to see how you she touches the paper and pets it with the back of her hand. And she’s so fast too! She is a pro. You should see me fold one. It ends up all crumpled and ugly. Good thing I have daughter’s who are master folders. I would totally wear a dress like that! Love the look of the dresses (50’s style? ), and of course the garland!! What a cool idea!! What a lovely blog you run! I found lots of inspiration and I’ll come back often! Jillian! I love this so much and your video is GREAT! I love Origami, specially easy things that I can work also with little kids. The dress is lovely. I love it!! just made a few of these and my dauthers are already playing with 🙂 thanks for this lovely idea! Thanks for sharing your thoughts on head shop locator. Where did you get your origami paper? They look adorable! I actually bought a lot of it in Japan a few years ago. But I did find some lovely paper on Amazon as well! How fashionably adorable is this…cannot wait to make this for a Mother’s day card! Ha! I still have to change the music in the video. It’s so repetitive and mesmerising (in a bad way). Good luck with your Mother’s Day card! 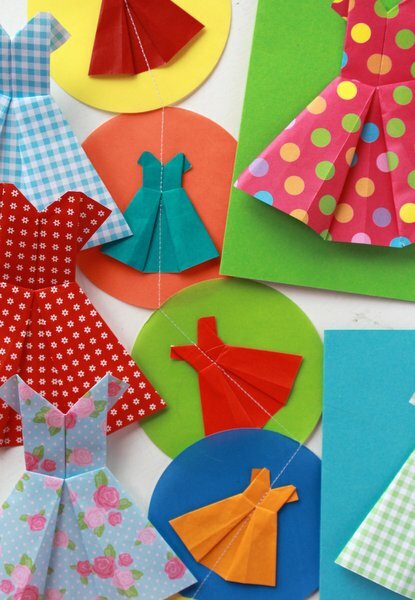 What is the measurement of the paper you used to make the origami dress and shirts? It is amazingly cute. I daughter my would love to do them. Thanks in advance. Did you get an answer to question ? everywhere I went there are no sizes !! wish they would think of the sizes cause I use recycled stuff and knowing the size paper would be a big help. Awesome! I love origami and I’m going to try this very soon! It’s a fantastic personalized gift.